Something exciting is happening in the Kingfisher Centre! A new us for the new year. We’ve made some changes to bring you fantastic fun and great value. 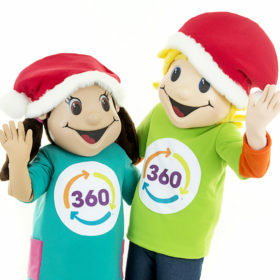 360 Play Redditch has rebranded as 360 Play Town and is offering lower prices, free adults (off peak), no registration fee and two new, great value, annual passes. Come and see the new us! My first time coming to 360 Play Town and it’s lovely, I was just walking by in the shopping centre with my little girl and thought I’d come in. The price is really reasonable and the variety is fantastic. The role play street is great I was expecting just a ball pit but there is so much more. I’ve been having a look through the menu and it seems good but my little girl went with the 5 item snack pack so her having the option to choose what she wants and put it into the lunch bag gives her that independence, even though she’s too busy playing to eat it all right now. I found the customer service very welcoming. And living in Redditch I will definitely come again. Peak Pass £95 admits 1 child and 1 adult. Off Peak Pass £65 admits 1 child and 1 adult. All customers of 360 Play must register with us. Membership registration is FREE. Speed up your first visit by pre-registering HERE. SEN nights are on the first Friday of every month. Located in the Kingfisher Shopping Centre in the heart of Redditch town centre – with great road access just 10 minutes from either J2 or J3 off the M42 (follow signs to Redditch town centre). Once you arrive in Redditch you will drive onto a ring road which circles the town centre. Car Parks 2, 3 and 4 are located off the ring road. This is the second time I have taken my son to 360 Play, in Redditch now & thought it was worth a review. Although a little on the expensive side, the place is great fun for children (and adults, if you want to get involved)! There are no time restrictions and once inside, you can use whatever you want, for however long. There’s many role play stations, such as a vets, a shop, a fire engine & plenty more & a large soft play area. You also have access to a carousel ride & dodgems, which are both operated by members of staff (who I have to say are all very friendly and welcoming). One thing that always impresses me, is how they keep it so clean. If you don’t want to get too involved, there is plenty of seating for parents and a cafe for hot food, snacks & drinks. My child is only 2 & half, so I have to be a little more hands on, but if you have older children, you could easily take a book (or whatever suits you) and chill out, having a bit of you time, whilst they have plenty of entertainment. I have only been to the Redditch one, so cannot speak on behalf of the other branches but you can easily occupy children there for a few hours. It is based in the Kingfisher shopping centre, so you can park there, if driving. Fab fab fab. First place I have been to and felt safe leaving my 5 year old to run free with his friends! Food is great and I just felt like I could relax a little which is very rare when you have children! It really is kids paradise! Celebrate Mother’s Day on 31st March in 360 style with this family ticket deal. Book your family ticket online and enjoy a day of family fun for 4 people for just £15!